If you live in Lancaster, PA, you either know about Prima, or you’re about to. In a few short years, they’ve already established themselves as one of the city’s premier destinations for art and entertainment, and in a location as vibrant as Lancaster, that’s an accomplishment to be proud of. We’ve been friends with Prima for a long time now, and we’ve already worked on a few projects together, so it’s been exciting to see them flourish and grow. Since they were founded, they’ve been putting on productions in a variety of spaces around the county, so it’s a big step that they’re moving into their own home in 2019. Prima knew they needed a great film to spread awareness about their new location. 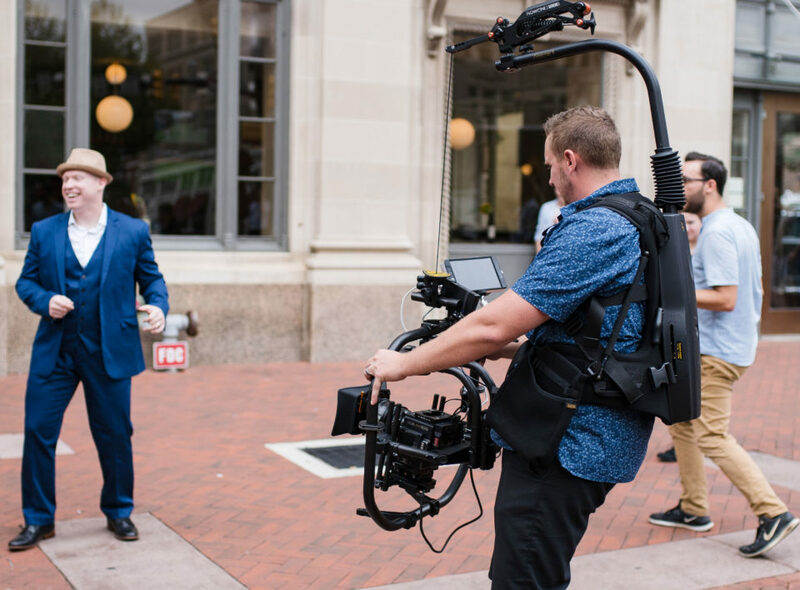 When we met with them, we discussed a few ideas – like a series of sketches – but quickly settled on filming an all-out musical number on the streets of Lancaster. There’s an old piece of storytelling advice: “show, don’t tell.” In this film, we didn’t want to just tell you that Prima is great. 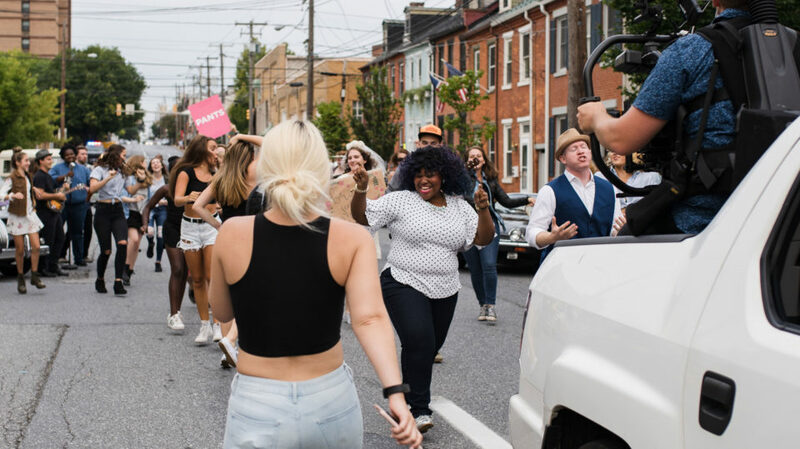 We wanted to collaborate with them to create an original musical number, complete with dancers, choreography, and (it sure seemed like) half the population of Lancaster. We wanted to show the kind of fantastic show Prima puts on. This was without a doubt one of the most rewarding projects we’ve ever taken on. 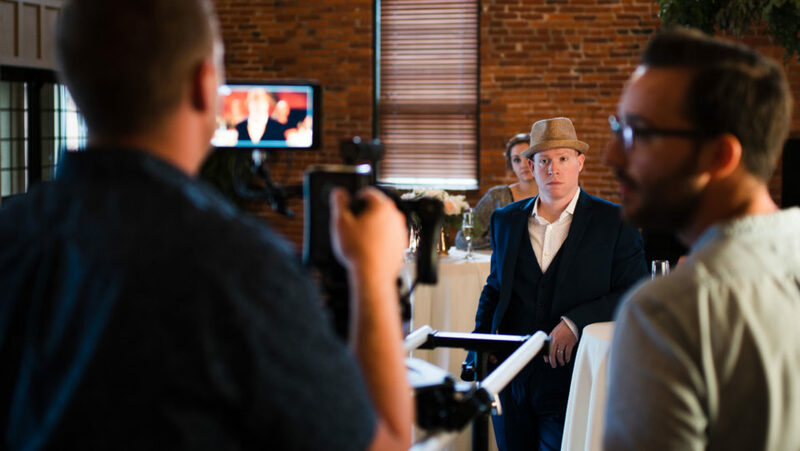 One of the greatest things about what we do is the wide variety of talented and passionate people we get to work with, and on this project we worked with a lot of people – a songwriter, choreographer, singers, dancers, musicians, and the list goes on and on. The fact that it was a new challenge, and brought a large group together from Lancaster’s creative community, made us even more invested in making it an excellent tribute to Prima’s musical theater offerings. We recorded the musical tracks with Andy Mowatt at the Sugar Tank, where Amber Schonfelf and Kevin Faraci laid down the kind of flawless vocals that set the bar high for the rest of the production. Then we took it to the streets, filming all the scenes in one day. Thanks to all the great people on set, from our leads to our producers to the generous extras who made each shot feel alive, the whole process was enjoyable and satisfying. We believe that great promotion should be great entertainment. We have an arrangement with any audience: we have to provide something in exchange for their attention. We think that, teaming up with Prima, we’ve done that with this film. This isn’t a one-size-fits-all piece of advertising – this is something that couldn’t have been made for anyone but Prima. And that’s what we were shooting for. Something great, something memorable, and something specific. We hope it makes you smile.